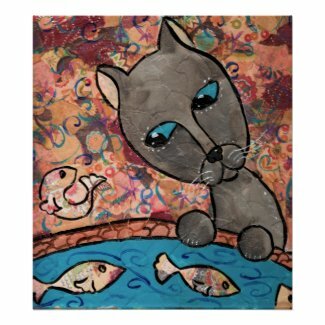 The gallery of Russian Blue cat pictures shown here is a feast to the eyes. These posters and prints capture the beauty and unique coloring of these majestic felines. 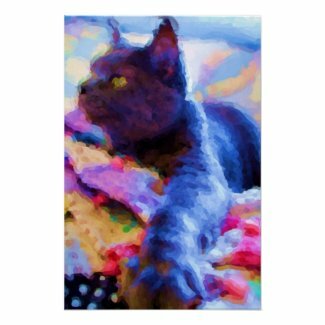 If you are looking for a gift for a Russian Blue fancier, consider giving her a picture of the gorgeous Russian Blue cat. Of course, the pictures presented below make wonderful gifts for all cat lovers. Russian Blues are best known for their silver-blue fur. They only come in this color, which is also described as blue-gray. This is a short-haired breed. 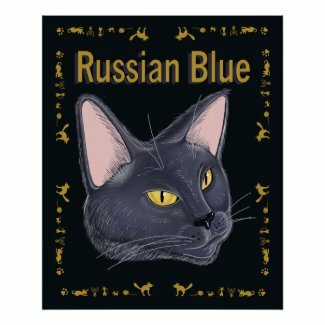 Its exact origins are not known, but experts believe Russian Blues are native to the Archangel Isles in northern Russia. That’s why Russian Blues are sometimes called Archangel Blues. 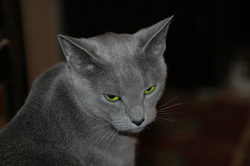 Russian Blue cats tend to be shy, but they are very sweet and affectionate. Tom (from the famous cartoon duo Tom and Jerry) is believed to be a Russian Blue. Not all blue cats are Russian Blues. 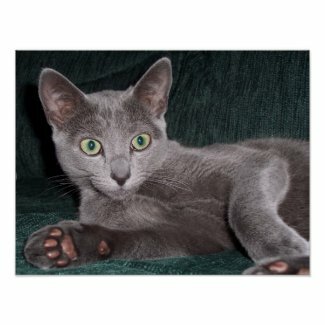 The following Russian Blue cat pictures are brought to you in affiliation with AllPosters.com. These pictures are brought to you in affiliation with zazzle.com. Learn how to sell your artwork online at Zazzle. I love collecting cat quotes. I find that most quotations about felines offer a rare wisdom. And most a very funny, too. Visit our cat quotes page for more sayings about cats.